How Will You Celebrate Inspire Your Heart with Art Day? It is very easy to celebrate Inspire Your Heart with Art Day here in Paso Robles. Artists abound here on the Central Coast, and there are many places where you can see their work. 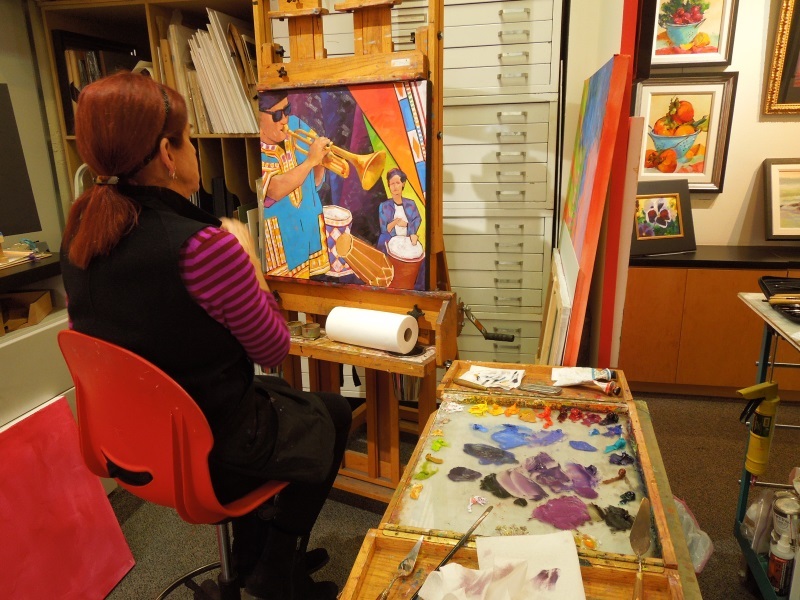 One way to inspire your heart with art is to visit a local gallery like Heritage Gallery West or one of the exhibits at Studios on the Park. You are sure to find some art that will inspire you at either place. 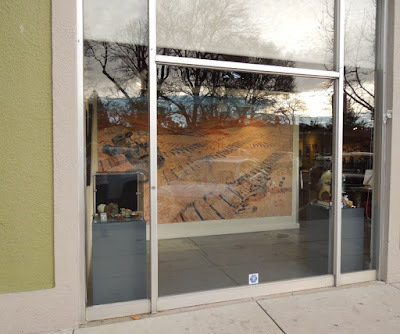 I visited Studios on the Park recently, and the first thing to catch my eye was the window display for the currently showing "Migrations" exhibit. The windows here always have two works of art. One is the collection of art pieces put in the windows to be viewed by those passing by. The other is the reflection from the park across the street. On this visit it was nearing time for sunset. So you see the painting inside the gallery, and you see the reflection superimposed on it. I've never come away from Studios on the Park without amazement at how creative the artists are. 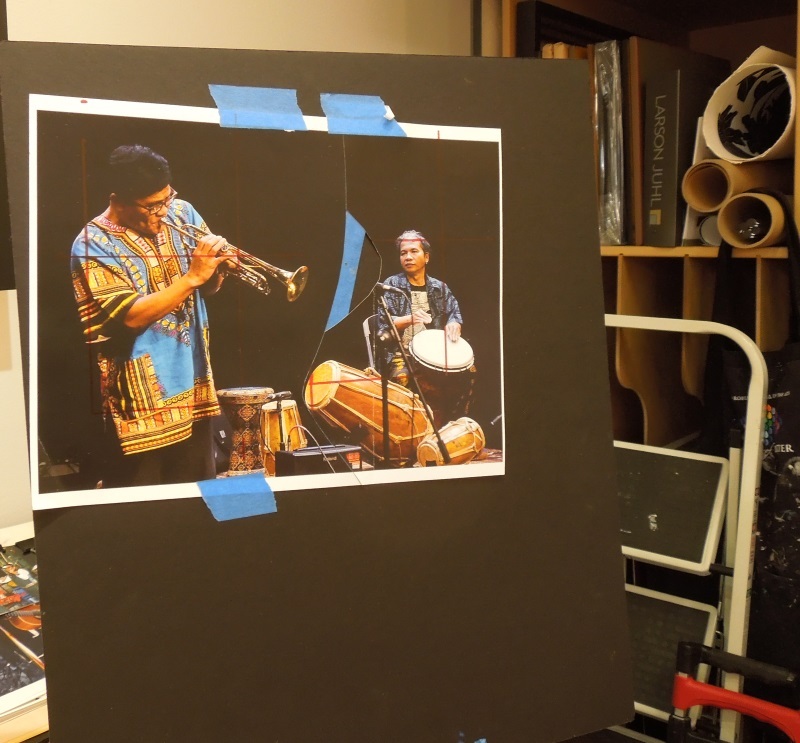 On this visit I talked to two artists preparing for the Soundscapes Exhibit which opens on February 4, 2016. They are working in two completely different media. The first one I talked to was Eve Chartrand. I was intrigued by the violin she was working on. She allowed me to let her explain how she was transforming it, in this video. See a previous post written after a visit to Eve's studio, which she shares with Anna Meyrick, here. The other artist I talked to was Anne Laddon. She was also preparing work for the Soundscapes exhibit -- five paintings. We see her here at work on one of them in her studio. She is looking critically at something she wants to change in the color scheme in this painting and is pondering what color to substitute for the one she's not happy with. She is working from this photograph as a model for her painting. This visit made it obvious to me that before I see art that inspires me, an artist's heart first has to be inspired to create it. If the artist isn't inspired first, the artwork will probably not inspire those who see it. I love going to Studios on the Park because I can see the creation process and learn what is in the mind of the artists as they create. I'm anxious to see the finished works I saw in the process of creation. I hope I'll be able to go to see the Soundscapes exhibit this weekend. I'll have to admit that National Seed Swap Day caught me off-guard. I don't have a lot of seeds to swap today, but neither do I see any announcements of local events for swapping seeds today. The only seeds I have an abundance of are calendula seeds. I would be happy to share those seeds year round with anyone local. I also collected a few kale seeds last year, but I will need to use them all myself. Maybe the thing to do would be to suggest a neighborhood seed and plant swap for one of these weekends coming up. Now that my neighborhood has an email list, it might not be too difficult to get the word out. 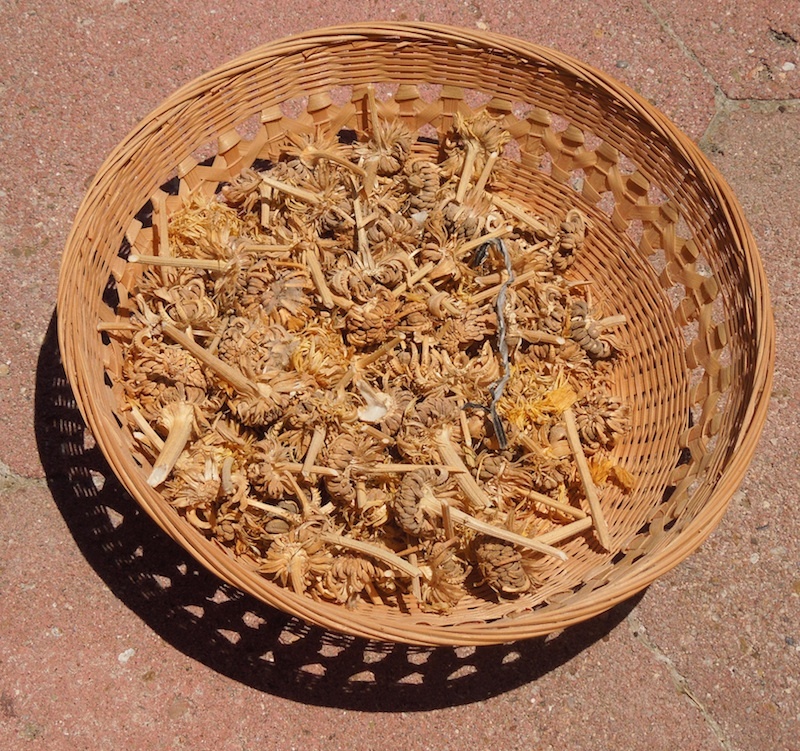 I can help a lot of people get these lovely calendula flowers into their yards. Once you have calendula flowers, you will never run out of them. 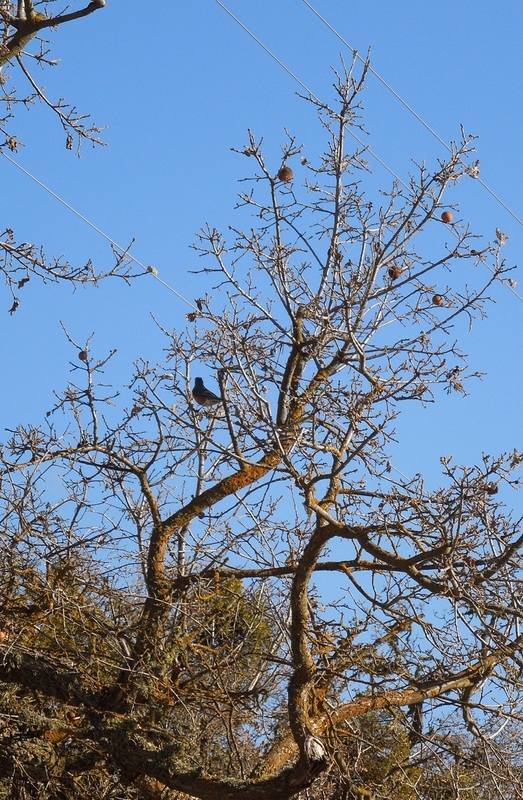 The photo below was taken on January 26 -- in the middle of winter. 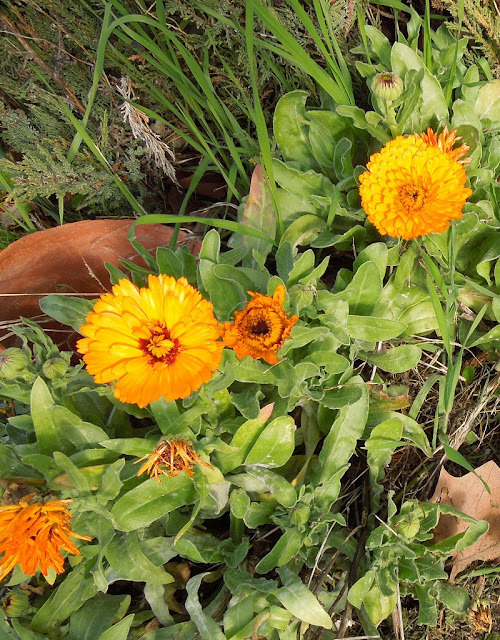 See more photos of the calendula I've grown in various stages of their lives, and learn how I eat it. January 29 is National Puzzle Day. I have always loved jigsaw puzzles. That's why I enjoy being able to make my own puzzles now at Zazzle. I can use any of my favorite photos of the California Central Coast or anywhere else that has special meaning to me and make them into puzzles at Zazzle. Why not celebrate national puzzle day by making a puzzle with your favorite photo? I will show you how I make a puzzle by making one with with the photo to the right. I have chosen a vertical photo to use because Zazzle seems to only display vertical puzzles correctly in my collections. You will want to have a digital image of your photo that is 11 x 14 inches or 14 x 11 inches if you want to make it horizontal. The resolution should be 300 dpi. Zazzle puzzles come in two sizes. This one 11 x 14 inches. 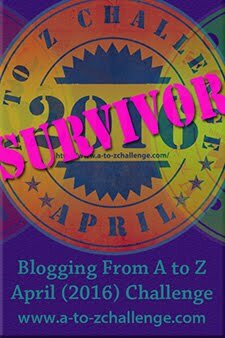 Go to the page here on Zazzle where I made the puzzle below. On the right hand size of the page, click CUSTOMIZE IT right next to the blue ADD TO CART BUTTON. Right under where the button was, several options will appear. First there is a drop down menu where you can choose vertical or horizontal orientation. I chose vertical. You will see that the space where my puzzle was displayed has gone blank. Click the blue UPLOAD NEW IMAGES button, which will take you to another page where you choose your image and upload it. It may take a few seconds or minutes for the image to upload. Soon you should see your photo appear under the blank space and in the spaces on the right where it says CHANGE IMAGE. If the big box is still blank, click ART VIEW UNDER the empty box and your photo should appear. If for some reason it doesn't, click on the images until one of them appears in the blank box and fills it. Use the cross next to the EDIT button on the right to arrange your photo the way you want it if it's larger than the box. Select the size you want your puzzle to be from the size options on the bottom right (not shown in the image above , which doesn't show that far down.) Click SAVE and add to your cart. You have finished making your puzzle. All you need to do is check out. If you'd rather save yourself the fun (or trouble, depending on how you look at it) of creation and pick a puzzle that someone else has already created, you can find puzzles for every subject you can imagine here. 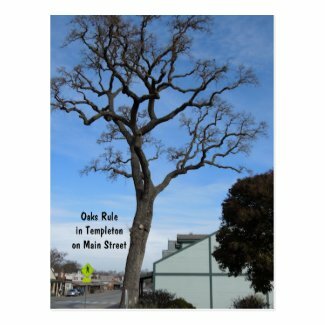 If you prefer scenes from California, and especially for San Luis Obispo County, they are easier to find here. I have arranged the vertical puzzles at the top of this California Puzzle Collection because Zazzle choose to display all the horizontal puzzles vertically. If you click on one of those vertically displayed puzzles that should be horizontal, it will display properly on its product page so you can see it as it should be. 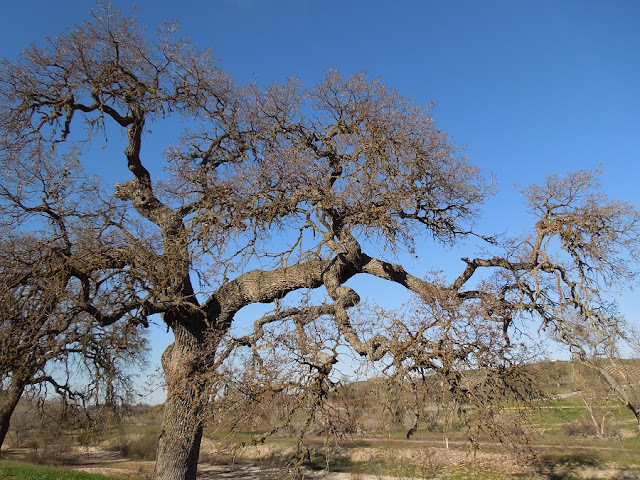 Oak trees are magnificent during all seasons. 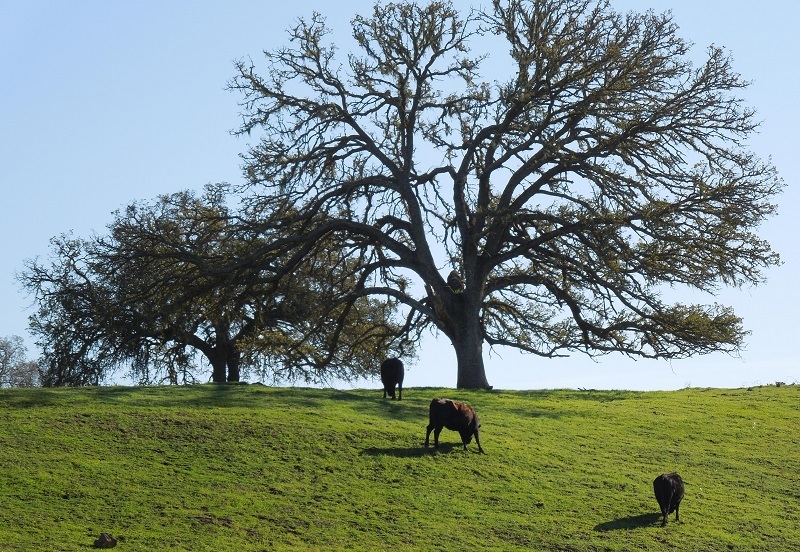 Some, like the live oaks, are evergreen. Many oaks on the California Central Coast, though, are deciduous. They lose their leaves in winter. That's when I think they are most interesting. 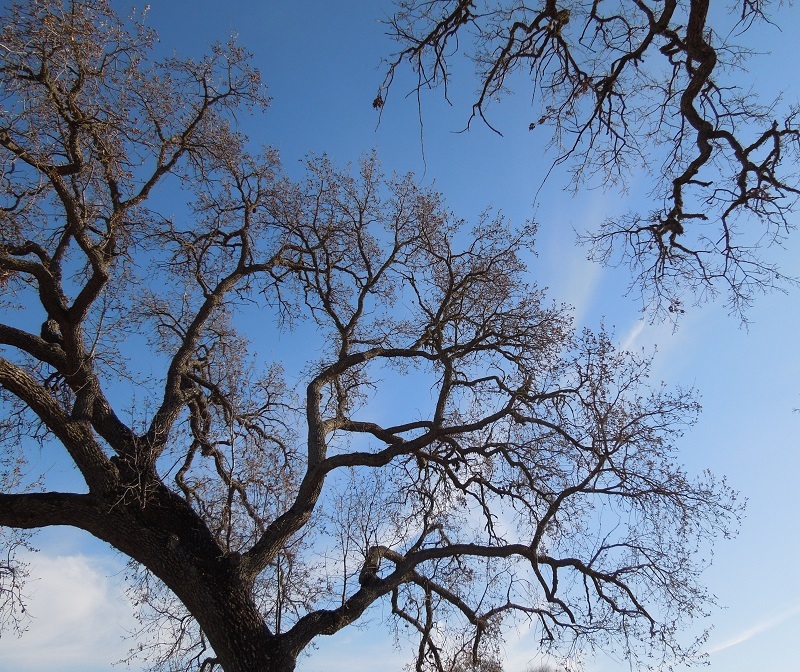 With the leaves gone, the oaks reveal their skeletons, their branches that are covered with leaves half the year. It's also easier to see lichens and galls once the leaves don't cover them. 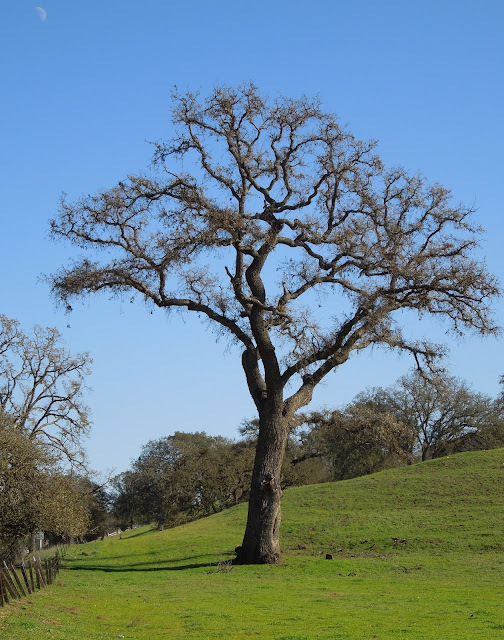 That's why in this post we will be looking at deciduous oak trees in winter. The oak to the right was photographed at Berry Hill Farm on Linne Road in Paso Robles, in January. Most of the leaves have dropped off. 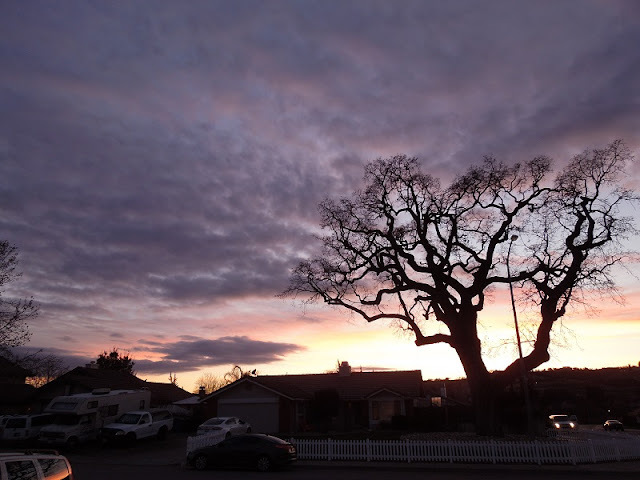 You can see the silhouette of the tree's skeleton. You can click most photos on this page to enlarge them. 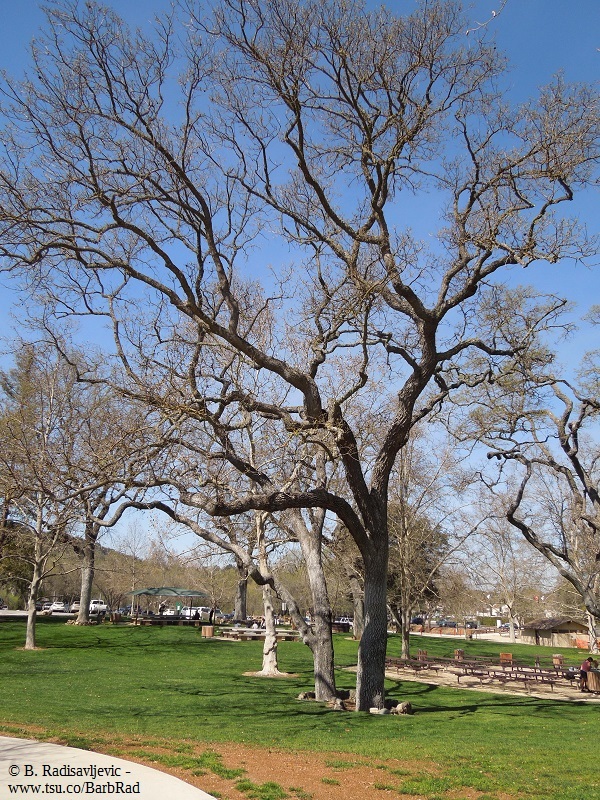 Here are more photos that reveal the "bare bones' of the oak trees. Some of the most interesting oak trees are those that have been damaged in some way. Sometimes they've had their shapes changed by man when they get too close power lines along the sides of roads. 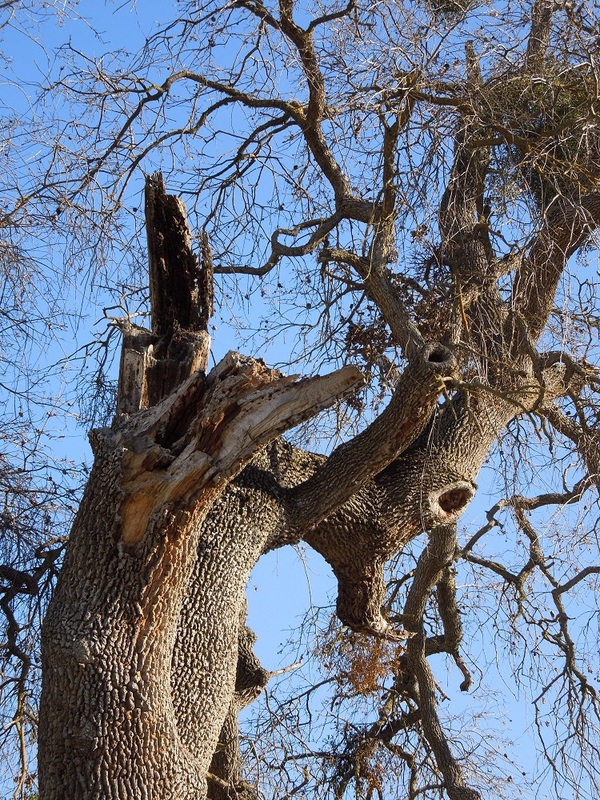 In other instances they've been damaged by fire or lightning. Insects and fungus can also attack oaks. If you see a ring of mushrooms around an oak, it's an indication the tree may be infected in the roots and bark, as well. 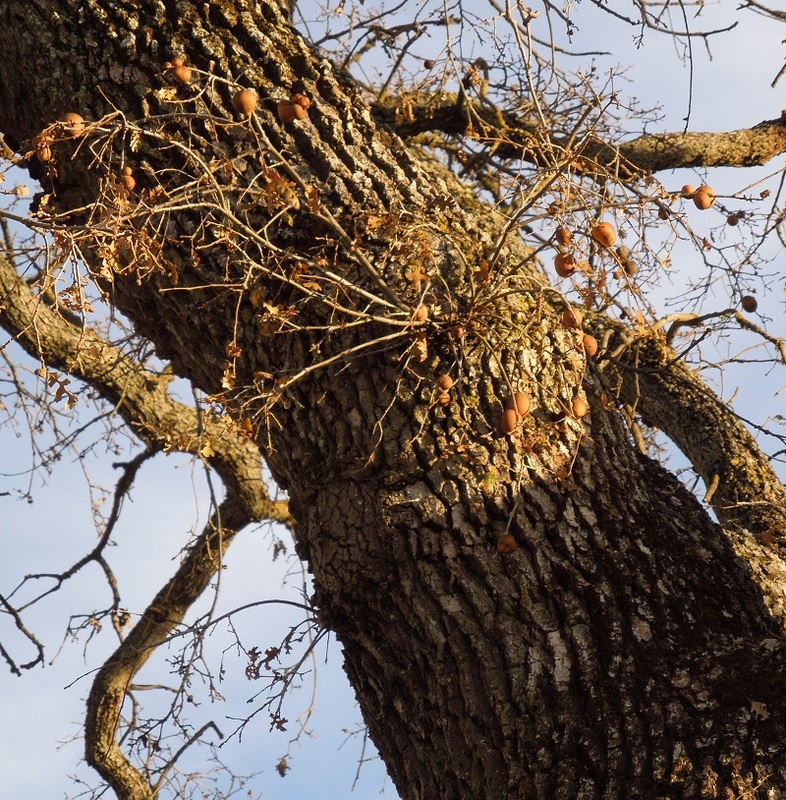 Oak root fungus can eventually kill an oak tree if the tree has also been weakened in some other way. I am not sure what has damaged the tree below. 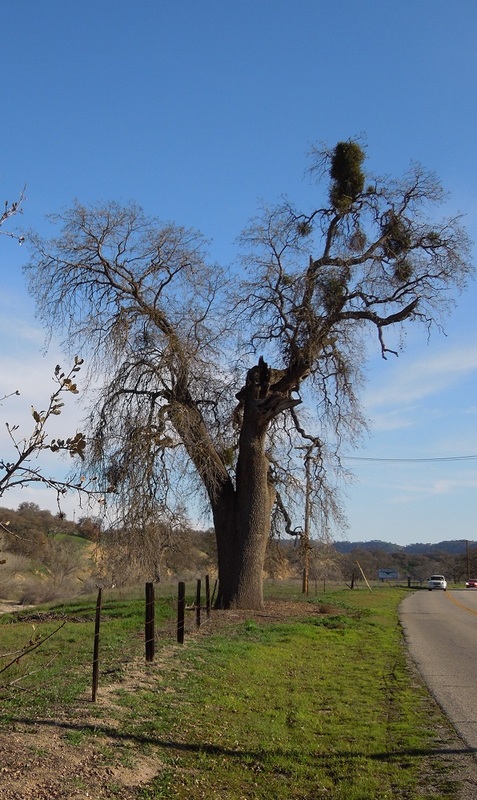 The mistletoe has probably weakened it, especially since the drought has stressed the trees and made them more susceptible to mistletoe's stealing of nutrients. Mistletoe can eventually cause the limb to break at the point where it is attached. With a tree's leaves gone, it's easier to see unusual growths on the oaks. 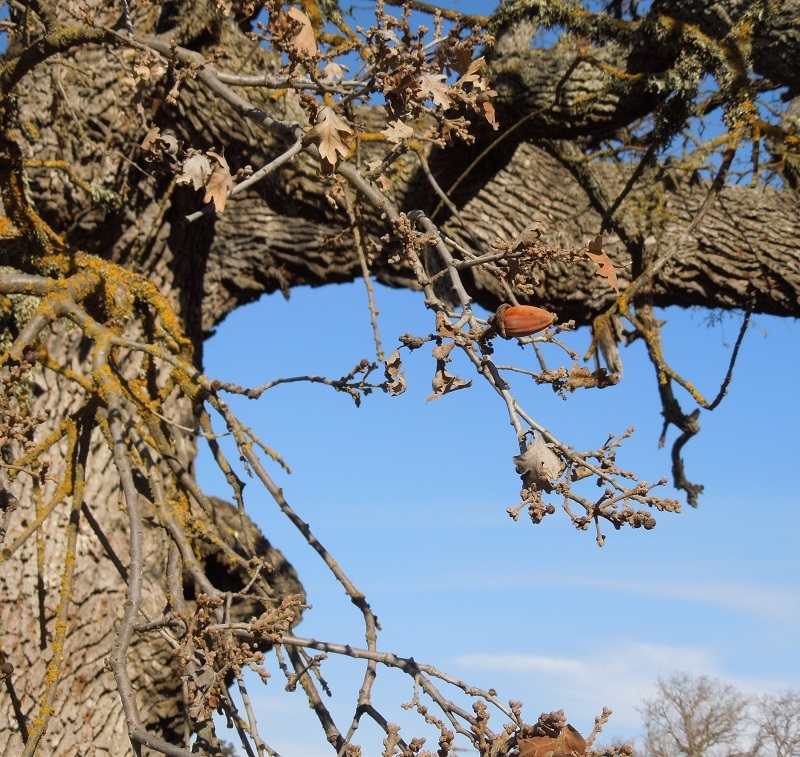 Two of the most common are lichens and oak galls. The round galls are made by gall wasps laying eggs. The lichens add color to the bark. Neither growth harms the trees, but they do add interest. The galls almost look like the balls one would hang on a Christmas tree, except they aren't shiny. It ought to be obvious now that I love oak trees, especially in winter. That's why I made a few designs at Zazzle using some of my photos. Most of the oaks I used in Zazzle products were photographed when they still had leaves, but these were taken when the leaves were gone. Since daisies bloom in June or July, I can't help but wonder why January 28 is National Daisy Day. Maybe it's a hint that people who want daisies in July should start planting seeds inside in January to have plants to put outside when the weather warms up in spring. 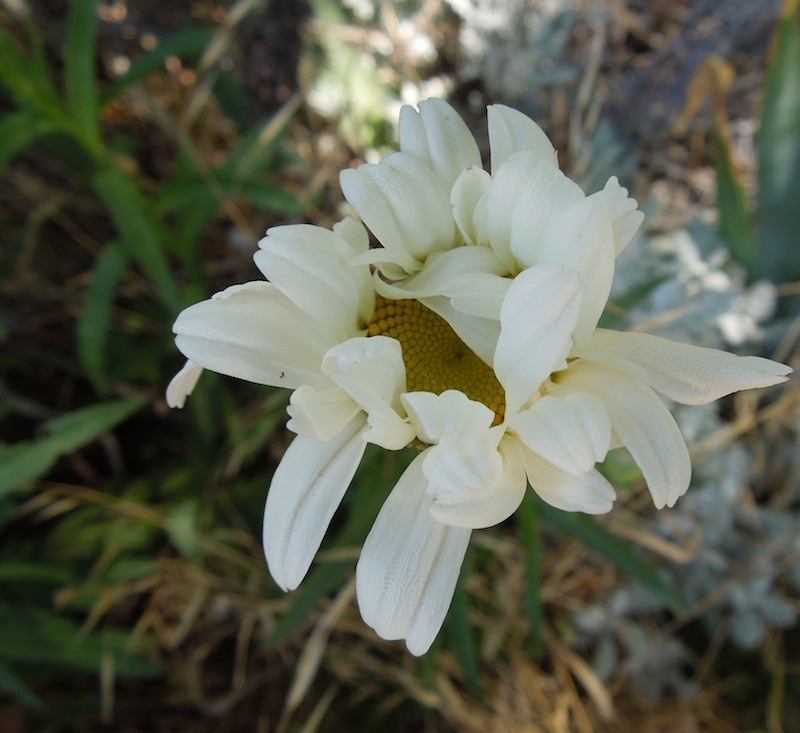 This photo was taken on July 8 in Templeton, California, and the daisy flower is just beginning to open. Shasta daisy seeds can grow plants ready to bloom in about five months. Of course, there are other ways to have daisies in January. They just aren't living daisies. An example would be this bouquet of approximately seventy artificial daisies (attached to each other as a whole bouquet) available at Amazon. One reviewer states they are very lifelike, even to their fuzzy yellow centers. Although there is only one stem at the bottom, making the daisy bouquet easy to place in the vase of your choice, the individual stems are bendable above that so that you can arrange the daisies the way you want them in the vase. Best of all, they won't ever wilt, die, or shed petals and pollen on your furniture. They can also be enjoyed by people who are allergic to the real flowers, but would still like to enjoy the beauty. Why not send someone this lasting bouquet to brighten the winter months? Another way to light up your life or that of a friend with daisy cheer is getting this daisy night light, complete with visiting ladybug. It got high reviews on Amazon. You can turn it on at night and off in the morning, but unlike some night lights, it does not automatically sense when to go on and off by itself. It is hand-painted and made of bonded marble -- no plastic. I like it much better than a plain old plastic night light. If you prefer another flower to daisies, click the link above or the image, you will see similar night lights made by the same company, Ibis and Orchid Design, in an assortment of flowers. This one even features a hummingbird drinking from a trumpet vine. In my garden, Shasta daisies mix well with other flowers and even herbs. They add a cooling effect when they bloom in July. 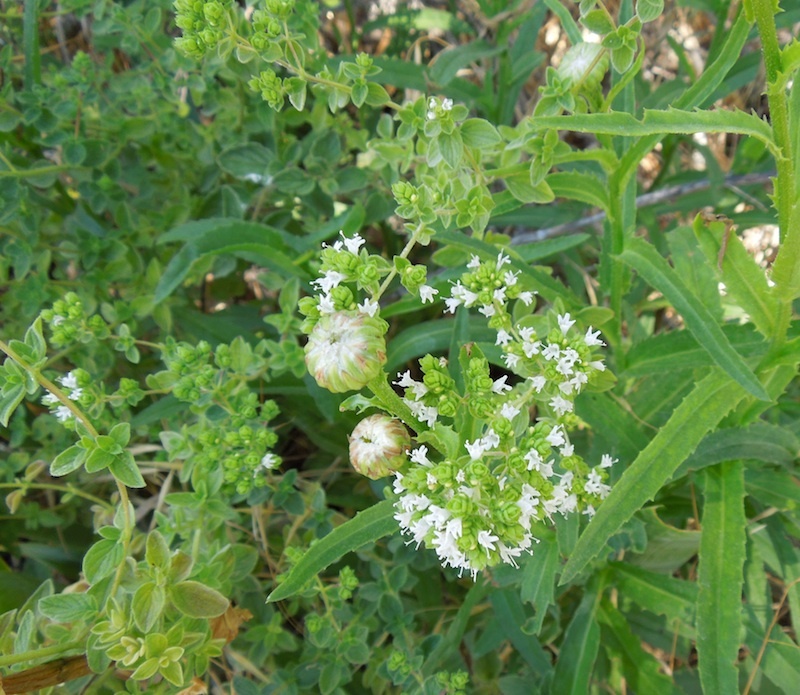 Even before they bloom, though, they look nice next to blooming oregano. These daisies are just budding in the middle of June. Do you love daisies? What is your favorite flower? 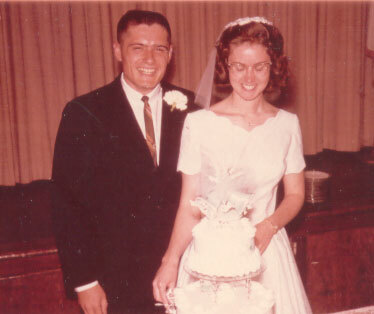 January 26 is National Spouses Day. It is a day for spouses to appreciate each other. 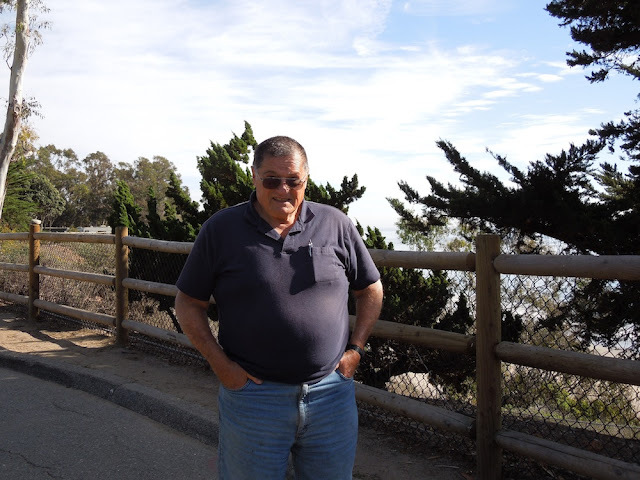 After over fifty years of marriage, I appreciate my husband more as each year passes and we can still enjoy each other's company. We've both changed a lot physically and mentally since this photo was taken on our wedding day. Some of our joints have worn out and been replaced and we've both put on more pounds. Those are the things one would notice just looking at us. When we got married, we had some big cultural differences we had to get around. I was born and raised in California. My husband was born in Serbia with some very definite cultural ideas about what was man's work and what was woman's work. These were reinforced by his mother, who would not have dreamed of letting a man get up from the table to get something from the kitchen if there was a woman there who could get it for him. That has changed. We help each other out. 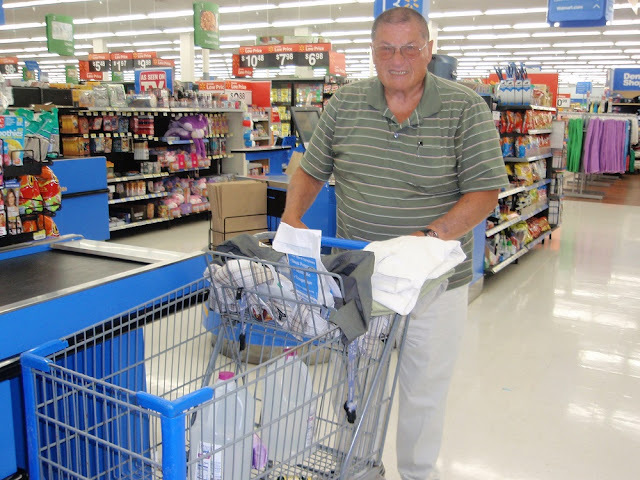 Whoever is out and about picks up what we need at a store or runs the errand that needs to be done. That used to be all my department. 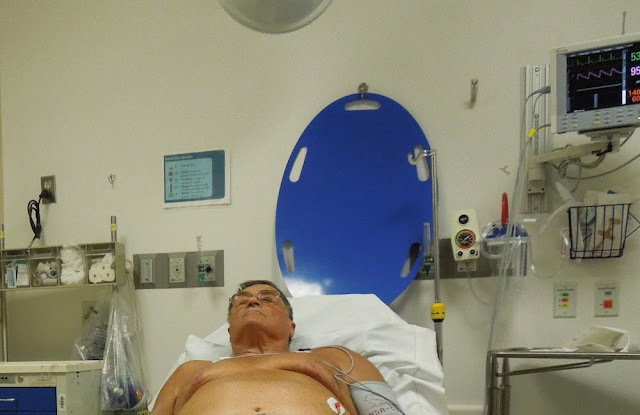 More and more frequently we take turns driving each other to the emergency room, medical appointments after surgeries, and helping each other when one is not so mobile. We are learning to care for each other when medical issues make us less independent for a time. Whichever of us is most able does what needs to be done at any given time. We even need to remind each other of important things we need to do so that doctor appointments, etc., aren't forgotten. Yes, they are on the calendar, but sometimes we still forget. What one can't see just by looking are the internal changes. We have done a lot of growing up. Adopting our children accelerated this process. 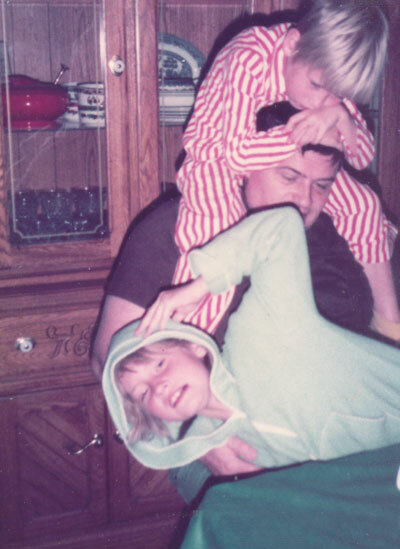 My husband was a good father and loved to play with the children, as you can see in this photo. Later, when my son died in an accident at the age of fourteen, we had to support each other through our grief. 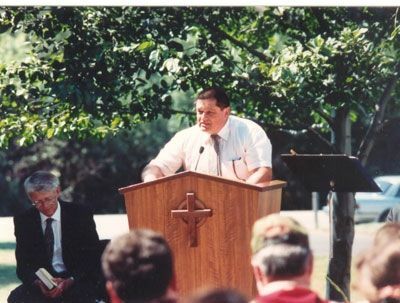 This is my husband sharing his thoughts at our son's memorial service. Because of the physical changes in our bodies, we can no longer do some of our favorite things together. One of these activities is hiking. It's hard to do when Hubby can't walk very far or for very long anymore. Sometimes I can't either. Sometimes we will go to a beautiful place where he can sit, while I walk. Often these are just rest stops while we travel on business. 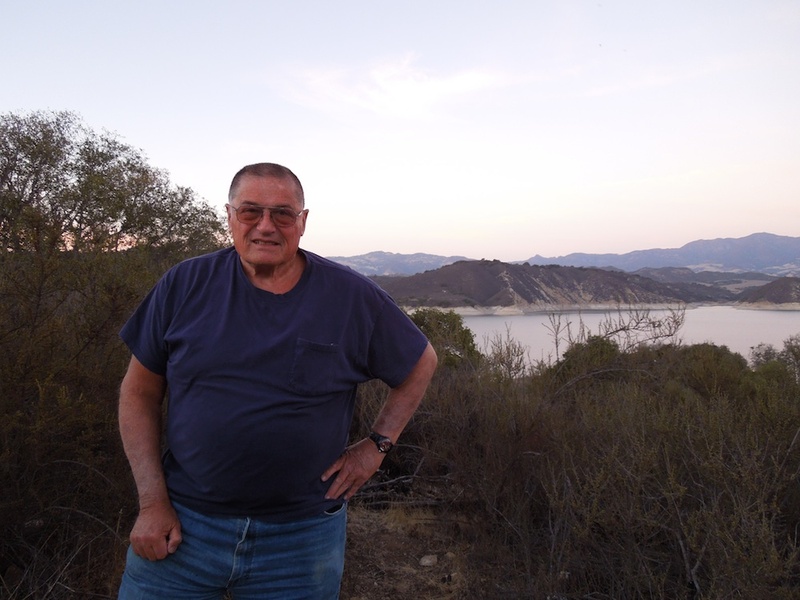 These photos were taken in Santa Barbara County on a day we had to go to Ventura. We used to enjoy traveling, but now that's hard, too. We do still both enjoy conversation and spending an afternoon or evening reading our books and just being together. That being together, after all, is what it's all about to have a spouse. As you live together, you grow together and year after year the relationship deepens if you can keep forgiving as hurts and misunderstandings happen. They can't help but happen when two selfish people try to live together. They happen much less as spouses adjust to each other's strengths and weaknesses and learn to appreciate them. If spouses give up on each other too soon they may discover too late that everything wrong was not the fault of the spouse. Marriage is for better and for worse, through sickness and health, through prosperity and poverty. If spouses help and support each other through each of these, forgiving if necessary instead of turning on each other to blame and accuse, they will grow into mature people who can take on what life throws at them together. At the end of the road of life, they will realize they were each other's greatest treasure. 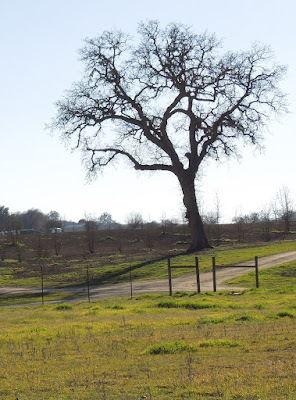 I saw this oak tree about a year ago on Linne Road, and it seemed to be a perfect place for an animal home. Since I'm a curious sort, I decided to take a closer look. You can click any photo for a closer look. 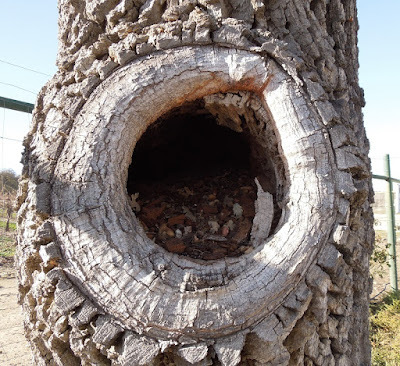 I noticed the hole in the trunk right away, which is why I wanted to examine the tree more closely. It's not very far off the ground, but it's quite hollow. Let's get a little nearer. 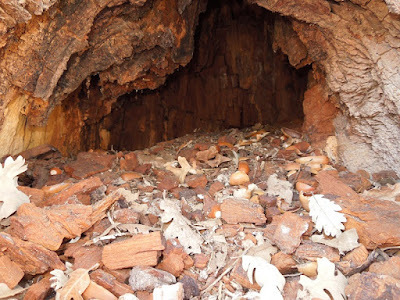 A closer look inside reveals lots of room for even a large nest, and it's obvious there's an abundant supply of acorns for any animal in residence. The question is which animal may live here, if any. Maybe no one is in residence anymore, but perhaps some animal may have called it home. Many small mammals would enjoy having so much food close at hand. 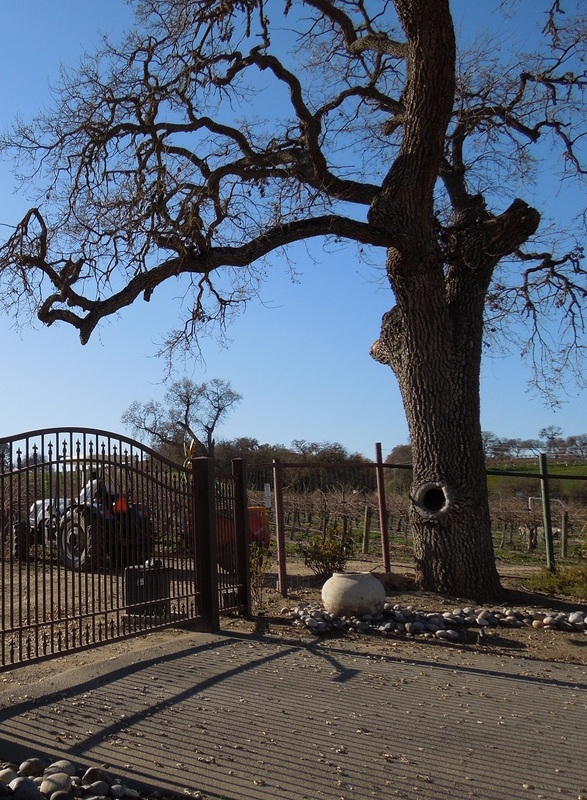 In autumn there is not only an acorn crop, but there is also a vineyard right on the other side of the fence. What squirrel, raccoon, opossum, or skunk wouldn't be happy with such a convenient food supply? Whether or not anyone lives or has lived here, I'm quite sure there are squirrels in the vicinity because I've seen them. I've never been here at night, so I've never had the opportunity to see the nocturnal animals. Perhaps squirrels have sought shelter here from time to time to enjoy a few acorns in peace. We are looking deep inside the tree here with a flash, so I believe a squirrel would be invisible to a hawk flying overhead were it to hide here. Now that I've satisfied my curiosity as to what's inside the tree, I will look above it. I think the treetops against the sky are a prettier sight on this January day. 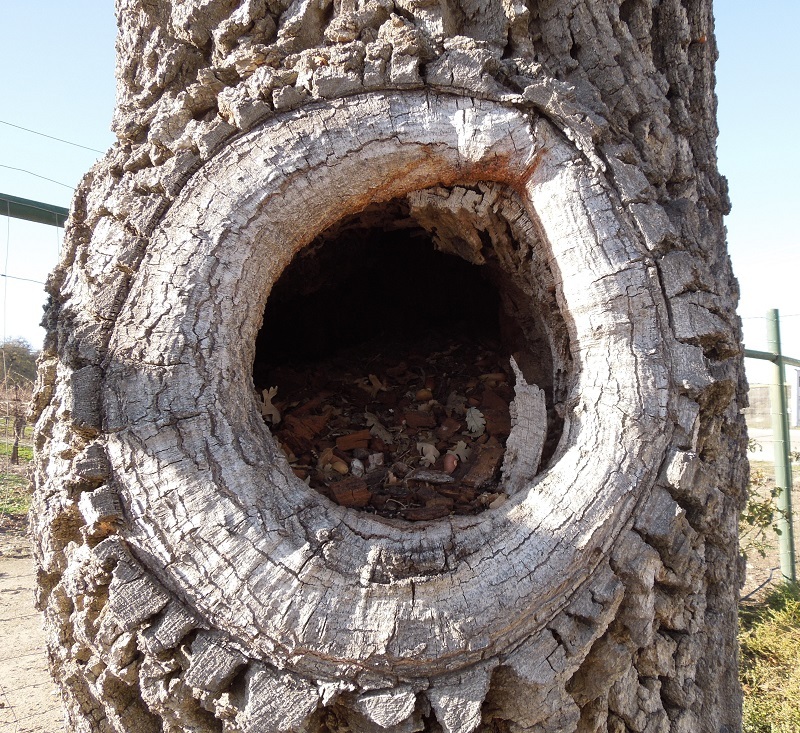 Who do you think lives or lived in this tree? If you'd like to learn more about squirrels and other small animals who might have lived here, read one of these books. I loved the Burgess Animal Stories, and the first one I ever read was The Adventures of Chatterer the Red Squirrel. My five-year-old self was enthralled by it, and my son loved it just as much. Burgess writes fiction that gives animals human emotions and motivations while staying true to their habits and natural characteristics. Read more about my introduction to the Thornton Burgess books here. Bonus: If you click through you'll also see a photo of me as a toddler.